The Cisco SF200-24 is a 24 Port 10/100 Smart Switch + 2 Gigabit Combo Ports (RJ45 + SFP) which is an affordable smart switch that combines powerful network performance and reliability with the essential network management features you need for a solid business network. These expandable Fast Ethernet switches provide basic management, security, and quality-of-service (QoS) features beyond those of an unmanaged or consumer-grade switch, at a lower cost than managed switches. And with an easy-to-use web user interface, Cisco Discovery Protocol, and Cisco Smartports, you can deploy and configure a rock-solid business network in minutes. Cisco® 200 Series Switches combine powerful network performance and reliability to build a business-class network. These entry-level managed switches deliver the essential network features you need, with the easy-to-use management you want at a great price. Support: with Cisco Small Business Support Service and a limited lifetime warranty. Simplicity:The SF200-24 is easy to manage and fan-less for quiet operation. High-speed desktop connectivity. Cisco 200 Series switches can quickly and securely connect employees working in small offices with one another and with all of the servers, printers, and other devices they use. High performance and reliable connectivity help speed file transfers and data processing, improve network uptime, and keep your employees connected and productive. Unified communications. The Cisco 200 Series provides QoS features to enable you to prioritise delay-sensitive traffic in your network and let you converge all of your communications solutions - such as IP telephony and video surveillance - onto a single Ethernet network. Cisco offers a complete portfolio of IP telephony and other unified communications products designed for small businesses, and Cisco 200 Series switches have been rigorously tested to help ensure easy integration and full compatibility with these and other vendor products. Easy configuration and management Cisco 200 series switch is designed to be easy to deploy and use by small businesses or the partners that serve them. Simple-to-use web-based interfaces reduce the time it takes to deploy, manage, and troubleshoot your network. Performance and reliability Cisco 200 series switch has been tested to deliver the high availability and performance you would expect from a Cisco switch and help you prevent costly downtime. The switch speeds files transfer times, improve slow and sluggish networks, keep your vital business applications available, and help your employees respond more quickly to customers and each other. With a network based on Cisco 200 series switch, you can address all of your business communication and connectivity needs and reduce the total cost of ownership of your technology infrastructure. Network security Cisco 200 series switch provides basic security and network management features you need to maintain a level of security for your business, keep unauthorised users off the network, and protect your business data. The switch provides integrated network security to reduce the risk of a security breach, with IEEE 802.1X port security to control access to your network. IP telephony support Cisco 200 series switch includes QoS features to prioritise delay-sensitive services such as voice and video, simplify unified communications deployments, and help ensure consistent network performance for all services. For example, Auto Voice VLAN capabilities let you plug any IP phone into your IP telephony network and receive an immediate dial tone. The switch automatically configures the device with the right VLAN and QoS parameters to prioritise voice traffic. IPv6 support As the IP network addressing scheme evolves to accommodate more devices, you can make sure that your network is ready. Cisco 200 series switch provides native support for IPv6 alongside traditional IPv4. That means you can take full advantage of IPv6-enabled operating systems and applications in the future, without having to upgrade your network equipment. An energy-efficient solution Cisco 200 series switch is designed to be energy efficient and eco-friendly without compromising performance. It helps conserve energy by optimising power use, which helps protect the environment and lowers your energy costs. The Cisco SF200-24P is a 24 Port 10/100 Smart Switch + 2 Gigabit Combo Ports (RJ45 + SFP) and 12 ports of PoE which is an affordable smart switch that combines powerful network performance and reliability with the essential network management features you need for a solid business network. These expandable Fast Ethernet switches provide basic management, security, and quality-of-service (QoS) features beyond those of an unmanaged or consumer-grade switch, at a lower cost than managed switches. And with an easy-to-use web user interface, Cisco Discovery Protocol, and Cisco Smartports, you can deploy and configure a rock-solid business network in minutes. Highly secure wireless connectivity. The Cisco SF200-24P switches work with Cisco and third-party wireless solutions to extend the reach of your network. Employees can work productively from conference rooms and common areas, collaborate in any office, and access business applications from wherever they are. With their security features, Power over Ethernet (PoE), Auto Smartports, VLAN, and QoS, these switches are the perfect foundation to add business-grade wireless to a network. Unified communications. The Cisco 200 Series provides QoS features to enable you to prioritize delay-sensitive traffic in your network and let you converge all of your communications solutions - such as IP telephony and video surveillance - onto a single Ethernet network. Cisco offers a complete portfolio of IP telephony and other unified communications products designed for small businesses, and Cisco 200 Series switches have been rigorously tested to help ensure easy integration and full compatibility with these and other vendor products. Power over Ethernet (PoE) Cisco 200 series switch with PoE . This capability simplifies the deployment of IP telephony, wireless, video surveillance, and other solutions by allowing you to send data and power to network endpoints over the same network cable. With no need for separate power supplies or outlets for IP phones, IP cameras, or wireless access points, you can speed up deployment and installation and take advantage of advanced communications technologies quickly, and at a lower cost. 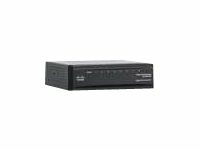 Network security Cisco 200 series switch provides basic security and network management features you need to maintain a level of security for your business, keep unauthorized users off the network, and protect your business data. The switch provides integrated network security to reduce the risk of a security breach, with IEEE 802.1X port security to control access to your network. IP telephony support Cisco 200 series switch includes QoS features to prioritize delay-sensitive services such as voice and video, simplify unified communications deployments, and help ensure consistent network performance for all services. For example, Auto Voice VLAN capabilities let you plug any IP phone into your IP telephony network and receive an immediate dial tone. The switch automatically configures the device with the right VLAN and QoS parameters to prioritize voice traffic. An energy-efficient solution Cisco 200 series switch is designed to be energy efficient and eco-friendly without compromising performance. It helps conserve energy by optimizing power use, which helps protect the environment and lowers your energy costs. The Cisco SG200-08 is a 8 Port Gigabit Smart Switch which is an affordable smart switch that combines powerful network performance and reliability with the essential network management features you need for a solid business network. These expandable Gigabit switches provide basic management, security, and quality-of-service (QoS) features beyond those of an unmanaged or consumer-grade switch, at a lower cost than managed switches. And with an easy-to-use web user interface, Cisco Discovery Protocol, and Cisco Smartports, you can deploy and configure a rock-solid business network in minutes. Simplicity:The SG200-08 is easy to manage and fan-less for quiet operation. The Cisco SG200-18 is a 16 Port Gigabit Smart Switch + 2 Gigabit Combo Ports (RJ45 + SFP) which is an affordable smart switch that combines powerful network performance and reliability with the essential network management features you need for a solid business network. These expandable Gigabit switches provide basic management, security, and quality-of-service (QoS) features beyond those of an unmanaged or consumer-grade switch, at a lower cost than managed switches. And with an easy-to-use web user interface, Cisco Discovery Protocol, and Cisco Smartports, you can deploy and configure a rock-solid business network in minutes. Simplicity:The SG200-18 is easy to manage and fan-less for quiet operation. The Cisco SF200-24FP is a 24 Port 10/100 Smart Switch + 2 Gigabit Combo Ports and 24 ports of PoE which is an affordable smart switch that combines powerful network performance and reliability with the essential network management features you need for a solid business network. These expandable Fast Ethernet switches provide basic management, security, and quality-of-service (QoS) features beyond those of an unmanaged or consumer-grade switch, at a lower cost than managed switches. And with an easy-to-use web user interface, Cisco Discovery Protocol, and Cisco Smartports, you can deploy and configure a rock-solid business network in minutes. Highly secure wireless connectivity. The Cisco SF200-24FP switches work with Cisco and third-party wireless solutions to extend the reach of your network. Employees can work productively from conference rooms and common areas, collaborate in any office, and access business applications from wherever they are. With their security features, Power over Ethernet (PoE), Auto Smartports, VLAN, and QoS, these switches are the perfect foundation to add business-grade wireless to a network. The Cisco SG200-26P is a 24 Port Gigabit Smart Switch + 2 Gigabit Combo Ports (RJ45 + SFP) and 12 ports of PoE which is an affordable smart switch that combines powerful network performance and reliability with the essential network management features you need for a solid business network. These expandable Gigabit switches provide basic management, security, and quality-of-service (QoS) features beyond those of an unmanaged or consumer-grade switch, at a lower cost than managed switches. And with an easy-to-use web user interface, Cisco Discovery Protocol, and Cisco Smartports, you can deploy and configure a rock-solid business network in minutes. Highly secure wireless connectivity. The Cisco SG200-26P switches work with Cisco and third-party wireless solutions to extend the reach of your network. Employees can work productively from conference rooms and common areas, collaborate in any office, and access business applications from wherever they are. With their security features, Power over Ethernet (PoE), Auto Smartports, VLAN, and QoS, these switches are the perfect foundation to add business-grade wireless to a network. Power over Ethernet (PoE) Cisco 200 series gigabit switch with PoE . This capability simplifies the deployment of IP telephony, wireless, video surveillance, and other solutions by allowing you to send data and power to network endpoints over the same network cable. With no need for separate power supplies or outlets for IP phones, IP cameras, or wireless access points, you can speed up deployment and installation and take advantage of advanced communications technologies quickly, and at a lower cost. The Cisco SG200-26FP is a 24 Port Gigabit Smart Switch + 2 Gigabit Combo Ports (RJ45 + SFP) and 24 ports of PoE which is an affordable smart switch that combines powerful network performance and reliability with the essential network management features you need for a solid business network. These expandable Gigabit switches provide basic management, security, and quality-of-service (QoS) features beyond those of an unmanaged or consumer-grade switch, at a lower cost than managed switches. And with an easy-to-use web user interface, Cisco Discovery Protocol, and Cisco Smartports, you can deploy and configure a rock-solid business network in minutes. Highly secure wireless connectivity. The Cisco SG200-26FP switches work with Cisco and third-party wireless solutions to extend the reach of your network. Employees can work productively from conference rooms and common areas, collaborate in any office, and access business applications from wherever they are. With their security features, Power over Ethernet (PoE), Auto Smartports, VLAN, and QoS, these switches are the perfect foundation to add business-grade wireless to a network.